Homemade ornaments are the best! 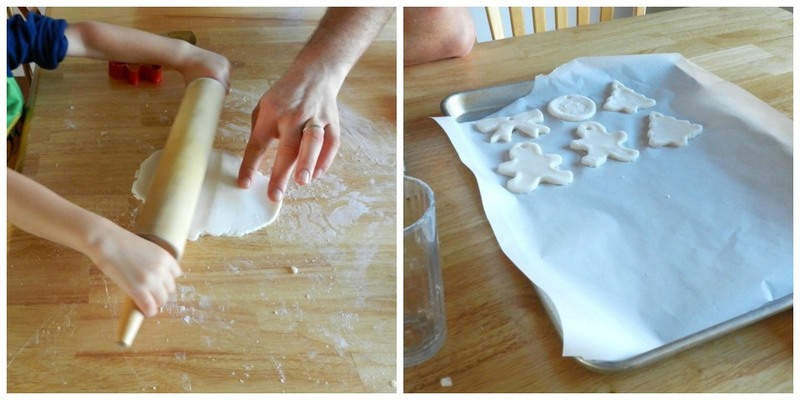 I have such good memories of making salt dough ornaments as a kid. One of my siblings made a cinnamon roll ornament that I will remember forever. It was the coveted ornament to hang on the tree every year...lol! I wanted to create the same memories for my little guy, so we tried making some cornstarch ornaments. This recipe uses cornstarch, water, and baking soda. You mix up the ingredients over heat and then let the dough cool. It rolls out nicely, but we had problems with it sticking to the table. After baking, they did crack a little on the backsides, but they were fun to stamp and paint! Our very own little gingerbread family... hehe! These are so cute! I can't wait to try to make them. Great idea! We'll have to try them next year. I didn't realize that everyone else coveted the cinnamon roll too! I guess I should feel lucky that I have it! Just some cheap acrylic craft paints. I did coat them with some modge podge afterwards though to make them shiny.